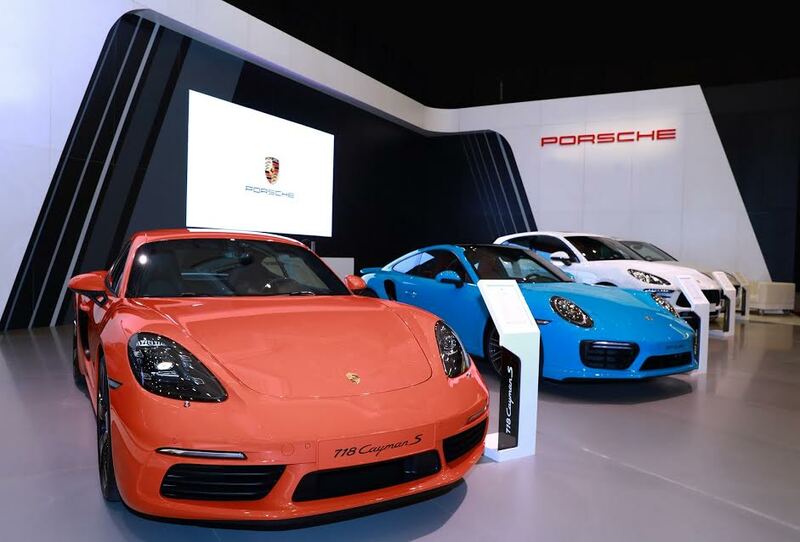 Jeddah: Porsche’s latest automotive developments are on display at the EXCS International Motorshow. Led by the redefined Panamera Turbo, the Stuttgart-based manufacturer’s segment-leading Gran Turismo was presented to the public in the Kingdom for the very first time. The new model has been redeveloped and redesigned down to every last detail and boasts enhanced sports car performance credentials with the unrivalled comfort of a four-door, luxury saloon. Car enthusiasts visiting the Porsche stand at this year’s motor show will also be able to see the 911 Turbo, 718 Cayman, new entry-level Macan and the Cayenne GTS up close until 21st October at the Jeddah Hilton. Guaranteed to encapsulate visitors, the second generation Porsche Panamera Turbo seamlessly combines true sports car performance with exceptional ride comfort. Featuring a newly designed 4-litre bi-turbo engine, the most powerful V8 petrol engine in the new range produces 550 hp, which results in a 0-100km/h time of 3.8 seconds. The new models feature Porsche dual-clutch transmission (PDK) with eight speeds and all-wheel drive as standard. Redeveloped from the ground up, the engines and transmission of the Panamera Turbo have been re-engineered and the chassis perfected. The new model achieves sports car agility and dynamic performance thanks to optional innovative systems. These include an adaptive air suspension with new three-chamber technology, including Porsche Active Suspension Management (PASM electronic damper control), the enhanced Porsche Dynamic Chassis Control Sport (PDCC Sport) system including Porsche Torque Vectoring Plus (PTV Plus), active roll stabilisation, and a new electromechanical steering system. A completely overhauled exterior design also adds to the sporty character of the new Panamera, with a typical Porsche sports car silhouette derived from the brand’s iconic 911. The body, in aluminium/steel hybrid construction, features extended, dynamic proportions, flared shoulders, athletic flanks and a much faster roof line which creates a stylistic link to the 911. The rear of the vehicle now further highlights the Panamera’s four-door coupé credentials, distinguishing it from a conventional saloon. Features such as the three-dimensional LED rear lights that include integrated four-point brake lights, interconnected by a narrow LED strip result in a distinctive night design. The new model’s interior has been reinterpreted for the future with black panel surfaces and interactive displays which combine to present an intuitive user interface similar to a smartphone, with all the practical requirements for controlling the car. For the benefit of the driver, front and rear passengers, classic hard keys and conventional instruments have been significantly reduced. Instead they have been replaced with touch-sensitive panels and individually configurable displays which take centre stage in the new Porsche Advanced Cockpit. Despite having an extended range of communication, convenience and assistance systems, operation of the new functions is now easier than before. The gearshift console between the driver and the front passenger is dominated by the 12.3-inch touchscreen of the new generation Porsche Communication Management (PCM) system, which the driver and front passenger can configure individually. Naturally featured in the PCM are Porsche Connect, smartphone integration via Apple CarPlay and a new voice control system that responds to natural language input. Also on display at EXCS is the new 718 Cayman which represents a generation change for the mid-engine sports car by paying homage to Porsche racing cars of the 1950s and 1960s. The two-seat mid-engine model is propelled by new turbo flat engines with four cylinders, offering an increase of 25 hp more than its predecessor. The 718 Cayman now produces 300 hp from 2-litres of displacement and torque output of up to 380 Nm, between 1,950 rpm and 4,500 rpm. When equipped with Porsche Doppelkupplung (PDK) and Sport Chrono Package, the 718 Cayman sprints from 0-100 km/h in 4.7 seconds. Comprehensively reworked, only the luggage compartment lid, roof and windscreen have been left unchanged from the previous model. All other aspects of the 718 Cayman have been redesigned. Saudi motoring enthusiasts will also have the first opportunity to see the latest addition to the brand’s compact SUV range in the form of the new entry-level Macan, which features a turbocharged four-cylinder engine. The model produces 252 hp and comes with a seven-speed PDK dual-clutch transmission as standard. This results in impressive acceleration of 0-100 km/h in 6.7 seconds, which is reduced to 6.5 with the optional Sport Chrono-Package. Offering an impressive 370 Nm of torque between 1,600 rpm and 4,500 rpm, the car is capable performing fast agile maneuvers and at an unladen weight of 1,770 kilograms, the Macan is the lightest SUV manufactured by Porsche. With a range of sporty models on display, the Porsche stand located in the main hall, stand E at the Jeddah Hilton highlights the brand’s commitment to produce benchmark sports cars in a range of segments.